Today is the Quirino Awards day, the awards of the Ibero-American animation industry that celebrate artists on both sides of the Atlantic Ocean. The award is dedicated to the author of the first animated Latin-American film: Quirino Cristiani, director of "El Apòstol" of 1917, an Argentinean film realized in 35mm with 58 thousand drawings and numerous miniatures. 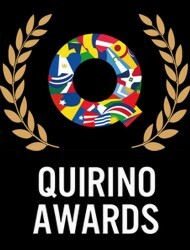 The official website of the kermesse is premiosquirino.org.